Shirley Erena Murray, of New Zealand wrote this hymn in 1992. It was written for an ecumenical service addressing the issues of health and welfare benefits for the people of New Zealand. It is deliberately political and is a hymn of protest and resolve. I think it speaks to the crisis our nation is in at the present time. dollars ration our compassion, hard decisions rule the day. Jesus of the healing Spirit, free us to another way! past the symptoms of our sickness let the voice of justice speak. Do you agree that taxes and tithes are to assist the poor and the common good? What systems in the USA meant to help people are in trouble and need to be healed? What is a “kindlier wisdom?” What parable or teaching of Jesus speaks of such wisdom? What are they doing to help the poor, the sick, the needy? 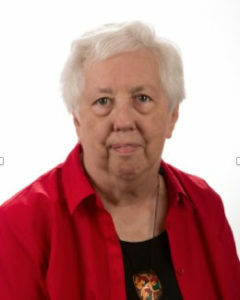 Shirley Erena Murray is a Presbyterian laywoman. Her husband John, is a retired pastor. She has been a teacher of languages, active in Amnesty International, and is a recipient of the New Zealand Order of Merit. Shirley Murray is one of the best hymn writers of today and her works are included in the most recent hymnals of many denominations.